Just before Christmas, I saw a poignant show (with an extraordinarily long name) that deconstructs Thornton Wilder’s classic play Our Town in a modern-day high school. On the night before it is scheduled to be torn down, generations of students – both current and former – converge on Ridgefield High School’s gymnatorium, and playwright Augie Praley as the story’s narrator reflects on the many lives that were changed in that multi-purpose space and recollects young love, heartbreaking loss, and frequent productions of Our Town. 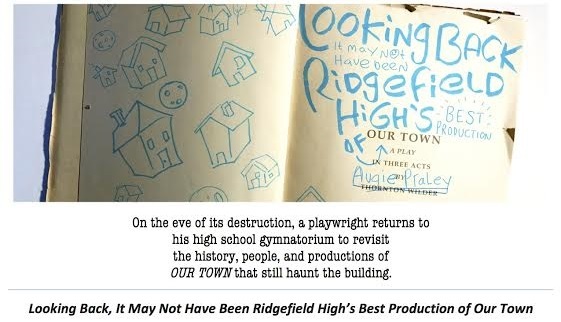 Looking Back, It May Not Have Been Ridgefield High’s Best Production of Our Town has been extended through January and February at the PIT, giving more audiences the chance to discover this delightful and surprisingly emotional gem. I was fortunate to have to opportunity to chat with playwright-actor Augie Praley and discuss his inspiration for the play and the relevance of Our Town today, nearly eighty years after its publication. Tell me a little bit about your background. How did you first get involved in theatre, and what made you want to become a playwright? I’ve been writing plays, screenplays, sketches or some variation of little dramatic scenes since I was a kid, but never really thought it would be my main gig. My high school had a very strong arts program and required us to take arts classes, so it was always sort of a no-brainer for me to become involved in theater. Everyone was, really. It was a small school, so even the lacrosse team was dancing and singing in the musicals. It wasn’t until college, when I slept through the two most important exams for my pre-med career, that I decided to give writing and the arts a whirl full-time – ’cause who’s going to hire a doctor who chain-smoked and slept through your appointments? I have since quit smoking, but not writing. What is your history with the play Our Town, and what about it made such an impression on you? I’ve been in love with Thornton Wilder’s writing since we had to read the play in high school English. I devoured nearly everything he wrote for the theatre and vowed to write with the kind of honesty and personality that he had found in his own voice. Our Town helped me find my voice in the theatre, by showing me what I loved in theater. Ira Glass, the producer of This American Life, has this great quotation about how at first you’re TERRIBLE at what you want to do, but you stick with it, because you have good taste. The taste you have in the art that fills your field is what drives you on until finally you can be yourself. I think, for me, a lot of Wilder’s works were the pushes I needed to get me towards becoming an artist. Where you ever involved in a production of Our Town? Nope! There were acting classes and English classes where I’m sure I read some monologue or a part out loud, but I was never in a production of Our Town. Nor have I directed one. I’d love to, if given the opportunity – I make it a point to see the show whenever it’s going up or the many filmed versions, so I’m sure I’d be tainted by David Cromer’s amazing production or Paul Newman’s Stage Manager in the PBS film. Might be one of those plays I need to keep myself away from. What first inspired you to write Looking Back…? It was 2011, and I had just completed a site-specific promenade style theater piece that was going to be produced in Tbilisi, Georgia. I had no idea what I wanted to do next, but was very into the kinds of work that Punchdrunk did with Sleep No More and their other projects, so I wanted to keep exploring it. The title came first, believe it or not, and then I had this idea to write a show that takes place entirely in my actual high school gymnatorium. You were going to have to pick and choose which scenes you saw by physically walking over to them. I liked the idea of missing out on things by choosing one scene or another. I love the “you can’t see everything” aspect of theatrical experiences like that – the theme which has continued into what the play is now. Eventually, the play became more and more personal, focusing on my own high school experiences, my own nostalgia and the wonder of how we grow as people and artists. It’s sort of blossomed from there. What made you decide to put yourself into your own play? I wasn’t in it originally! I read the stage directions out loud at a reading we did, and it just seemed to work. They were pretty much the lines that I say in the show now: explaining who people are, why they’re there, building out the legends of this school. I love the way Sarah Ruhl’s stage directions are more poem than literal description and add to the experience for the reader. That being said, I do have a history of putting myself in my projects – it just feels more genuine. Like a theatrical self-portrait of the artist at that time. Sometimes it feels like I’m journalling my current being into the piece that way. When you look at a really amazing self-portrait, Cindy Sherman comes to mind here, the artist reflects herself and the many different sides and facets of her being… I like doing that, too, but in my own way. It gets REALLY fun when people start playing you in the part. How did you find the balance between paying homage and deconstructing this classic play and also creating something that was uniquely yours within it? I think I’m still finding it! Back to the Ira Glass thing – it feels to me like the play is a smashing together of every playwright I’ve ever really loved, and at the end, hopefully my voice emerges victorious – or maybe defeated, just at least there’s a voice. The play uses techniques that Wilder used in a lot of his plays, as it takes techniques from Brecht and Chuck Mee and Sarah Ruhl and Ira Glass and improv and the storefront Chicago-style Theater that I fell in love with in college. The most important thing is that it felt genuine and personal and real. Aside from Thornton Wilder, what other playwrights have influenced in your writing? Will Eno, Chekov, Chuck Mee, Mickle Maher, The Neo-Futurists, The House Theater of Chicago for performance, Tom Stoppard, Kurt Vonnegut (not necessarily a playwright, but he’s written plays! ), Charlie Kaufman (he’s written plays, too!). In many ways, Looking Back… is a better reflection of modern times than Our Town, particularly in its inclusion of gay relationships and showing teenagers exploring their sexuality. Do you feel that Our Town can still be relevant for today’s audiences and for young students participating in school productions, and do you think it is necessary to rethink and reinvent plays like Our Town for modern audiences? I think Our Town will always have relevance to people, whether or not it’s an immediate reflection of the times they’re living in. It serves up universal themes of existence that I think will always resonate within us. I’d also say that it’s much easier to write gay characters or relationships now without being condemned, ridiculed or discounted as an artist. This is normal now, but would have been wildly revolutionary for Thornton to do so in the thirties. In thirty years, there will be a new normal and my play may seem obsolete. That’s ALSO something that feels like a continuation of themes of both my play and Wilder’s: you can’t escape the end of your life or your art’s life, what you can hope now is that you’re appreciating it while you have it. We should always be rethinking and reinventing old theater, even if that means we have to sit through hundreds of hip-new modernized versions of Shakespeare – it keeps those voices alive and remembered and keeps their poetry out in the world, and I think that’s important. They may not reflect the feelings of our times, but they do reflect, in some sense, what it meant to be human and that’s a feeling that pretty much transcends time. Parts of this show, particularly the ending, feel very personal and therapeutic. What did you get out of writing this play, and what do you hope that audiences take away from the show? There were certainly drafts that leaned more heavily on Our Town and had more ‘in’ jokes, but the true nature of the play sort of revealed itself as we kept working on it. I’ve never written something for this long of a period – I’ve been writing it for almost 6 years now – and in that time I became a different person, the world became a different place, so it started to feel like an archaeological dig through the last 6 and then as experiences of my own high school filtered in, the last 15 years of my life. It is a very personal ending and became more and more therapeutic as I wrote it. As we developed the play, it sort of became clear that the Playwright was the protagonist of this world he’d built, whether he realizes it or not. My brain became this Möbius strip of outside writer, being told what to do by characters from within the play he was writing and that meta-theatrical mind-bend was a really exciting place to be. The play is my journey and experience going through all of these things, but I want to take the audience along with me. It’s a rosy and not so rosy-colored look back at some very formative years–high school is a terrifying rite of passage at this point. Think of how many TV shows and movies we have about high school or high schoolers – it is that unique experience that nearly everyone goes through. High school is a metaphor for life in that way: something unique and individualized to you, and yet every single human has experienced it in some way. I want the audience to feel big and small at the same time, insignificant and important. I want you to come away from this show thinking about your own life and the Our Town you live in now. If we can’t manage all that, I’d just like for you to have had a nice time with us. Looking Back, It May Not Have Been Ridgefield High’s Best Production of Our Town is playing at the PIT from January 15 thru February 12. Tickets are $18 and are available for purchase in advance online here or by phone at 212-563-7488.